Gingerbread mix with coloured icing, writing Icing tubes and decoration guide. Includes cutter and writing icing tubes. Bakes in 12 minutes. Creates 6 biscuits. Let's bake yummy wildlife friends. No artificial colours, flavours or hydrogenated fats. You will need: 1 dessert spoon (12ml) vegetable oil, 2 tablespoons (30ml) golden syrup, 1 teaspoon (8ml) water, a little flour. Equipment needed: Baking tray, rolling pin, wire rack. Gingerbread Method 1. Grown-up step: Get the grown-up to turn on the oven to 180ºC (160ºfan), 350ºF, Gas Mark 4. 2. Crafty Cook step: Lightly grease the baking tray. 3. 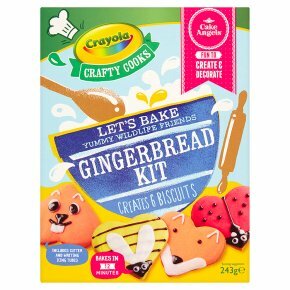 Crafty Cook step: Add the gingerbread mix, oil, golden syrup and water into a mixing bowl and mix together with a spoon until a soft dough isformed. 4. Crafty Cook step: Lightly dust your work surface with flour to stop your dough from sticking and then roll out the dough using a rolling pin until it's about 0.5cm thick (about thickness). 5. Crafty Cook step: Cut out your 6 biscuits using the heart shaped cutter (you will need to reroll your dough to use it all up!). Place them on the greased baking tray. 6. Grown-up step: Get the grown-up to place the baking tray in the oven and bake the biscuits for 10-12 minutes or until golden brown. Decoration Method 7. Crafty Cook step: To ice your biscuits make the water icing by emptying the icing sugars into separate bowls and adding 1/2 a teaspoon of water at a time (don't add too much because you want it quite thick!) until you have a thick but pourable icing. 8. Crafty Cook step: To make orange icing: make the red and yellow icing first and then add equal amounts of red and yellow to a separate bowl. Top Tip - To soften the icing tube squeeze gently in your warm hands for a few moments (with the top on the tube). 9. Crafty Cook step: Dip your biscuits into the icing to cover the top half and then place on the wire rack to drip dry. Once they have dried use your black and white icing tubes and follow the decoration guide to create your Wildlife Friends gingerbread biscuits. Top Tip - Leave your icing to set before starting to decorate your wildlife friend. WARNING: Not suitable for children under 36 months. Small parts, choking hazard.